Al Falaj Hotel Muscat offers the same levels of service, comfort and efficiency that tourists and business travelers have come to expect of Hotels worldwide. The Al Falaj Hotel Muscat is conveniently located in the heart of the city with easy access to both the business area as well as the tourist attraction. 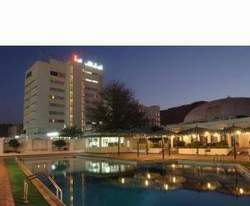 Al Falaj Hotel Muscat offers everything a business traveler needs, exotic cuisine, excellent conference facilities that are the best the city has to offer, courteous staff and a range of recreational activities that helps you to unwind. The complex includes tennis and squash courts along with two refreshing outdoor pools while the professionally trained staffs is certified to provide individual swimming, tennis, and karate lessons. In addition to these relaxing leisure activities, the lavish hotel also offers innovative ethnic cuisines, first-class meeting and banquet areas, and a friendly hospitable staff to ensure a pleasant stay. Al Falaj Hotel features an outstanding fitness and wellness centre complete with state-of-the-art work out equipment and separate gender facilities of a Jacuzzi, sauna, and steam room.